Mood Watch Bracelets are a digital watch and a silicone bracelet in one! They come in one size that fits most. 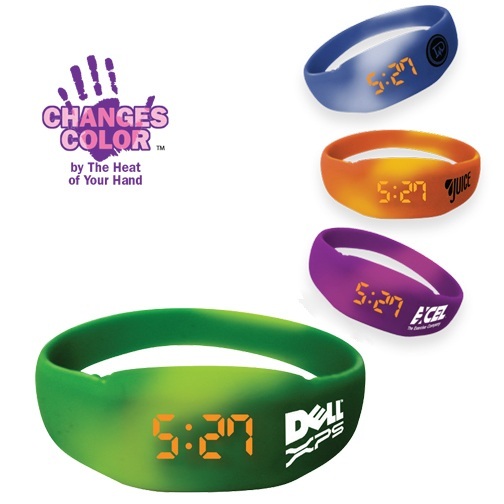 The Mood Watch is a bracelet made of soft silicone material that changes color with the heat of your hands. The Multi Function Display shows time, date and seconds counter. This product is a Tariff Target and prices may change. Contact us for current pricing. An additional $50 non-refundable artwork charge must be paid before work can begin. For logos and other artwork, add an additional $25. Mood Watch Bracelets are available in green to yellow, orange to yellow, blue to white, purple to pink. Standard Imprint Colors provided at no extra charge: Black, White, Red, Light Blue, Medium Blue, Dark Blue, Light Green, Medium Green, Dark Green, Brown, Purple, Yellow, Teal, Orange, Maroon. Size of Mood Watch Bracelets are 7-1/2" circumference, 1/2" band at face. Individually polybagged with instructions on bag. Warning: Severe weather conditions may effect the mood color change. Give us a call at 706-374-0710 and we will help you pick the best promotional product to advertise your business or special event and provide a Free Quote.